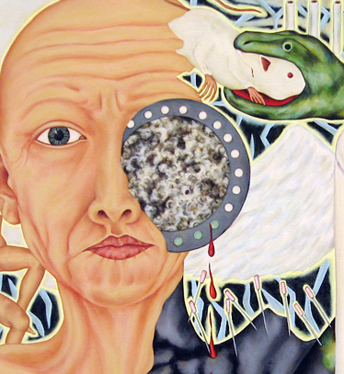 A closeup of Lynda Hess' "The Evolution of Eve," an oil on canvas. Four up-and-coming isle artists, all winners in the Honolulu Japanese Chamber of Commerce's 28th Annual Commitment to Excellence show, are exhibiting works at Nuuanu Gallery at Marks Garage through Friday. "The Fashion of Weight," featuring pieces by Tracy Gunn, Lynda Hess, Alan Konishi and Mat Kubo, explore "weight" in the literal and metaphorical sense. Gunn's mosaic sculptures discuss the weight of addiction. Hess' paintings document the artist's personal experiences and explore "the shift in societal, spiritual and political ideas around conception and the allopathic manipulation of female bodies." Konishi's work responds to pop culture, specifically rap music and its trends. His humorous pieces feature images of artist friends adorned with glittery gold teeth. 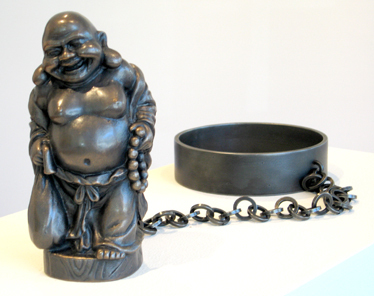 Kubo has created bronze sculptures of religious and sentimental icons chained to shackles. The works may inspire visitors to ask, "What is the weight of sentimentality?" Nuuanu Gallery at Marks Garage, located at 1161 Nuuanu Ave., is open 11 a.m. to 6 p.m. Tuesdays to Fridays and until 3 p.m. Saturdays. Call 536-9828. 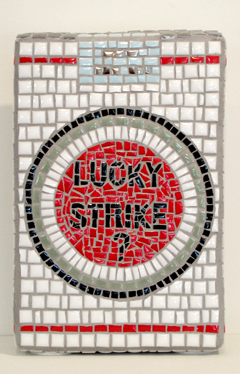 Tracy Gunn's mosaic sculpture "Lucky Strike? ", inspired by the cigarette box. Mat Kubo's "Gods, Grips, and Guilt, Article Two: Koan" is a bronze and steel sculpture. 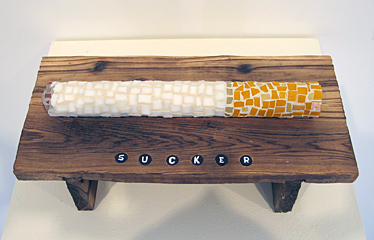 "Sucker," a mosaic and wood piece. Alan Konishi's "Ala Mode/With Ice C.R.E.A.M." 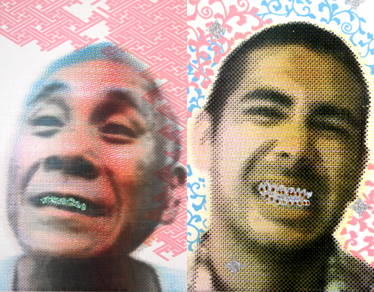 features artists Hideo Okino, left, and Brad Capello. The works are screen prints on wood panel with glitter and rhinestones.